Dominion Senior Living at Patrick Square celebrated their Grand Opening and ribbon cutting on February 7th and have now started welcoming residents into their brand new 50,000 sq.ft. home! Republican Sen. Thomas Alexander, as well as representatives from the Dominion Senior Living corporate office, Clemson Area Chamber of Commerce and Mayor JC Cook were present as they celebrated the opening of the 50,000-square-foot, $10 million community which provides compassionate care in a faith-based, meaningful environment. The community welcomed over 700 guest to tour the new community and join the Grand Opening celebration. Dominion Senior Living at Patrick Square provides 49 assisted living apartments and 17 apartments designed specifically for memory care. Team members thoughtfully prepare their hearts and minds to create a community which cares for seniors in a way which aligns with their mission of “honoring God through service to seniors.” The community strives to meet and exceed seniors’ spiritual, mental and physical needs on a daily basis through technological integration, on-site enrichment activities and professionally trained nurses and caregivers. The community is lead by Executive Director/Principal Lindsey Daugherty. Dominion’s Principal model holds high promises in the senior living industry. Daugherty is empowered to make a difference with autonomous decision-making and flexibility to meet her communities unique needs. 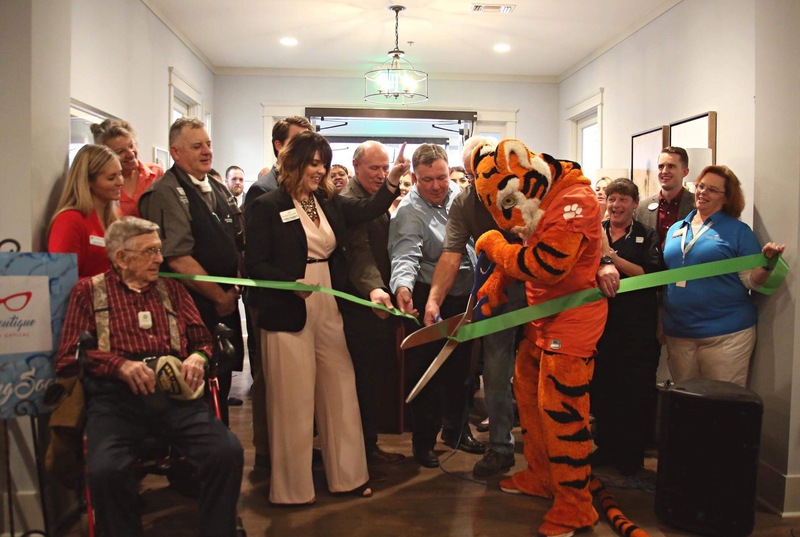 This new senior living community provides compassionate care for its residents and has created 50 new jobs in Clemson. It is unlike any other senior living community in the area, complete with nurses and caregivers available 24 hours a day in a safe, secure environment with trained professionals. All nestled in the traditional neighborhood of Patrick Square where residents can enjoy the neighborhood feel with all the conveniences of the services of the Patrick Square merchants. All these neighborhood amenities are a golf cart ride away. Dominion Senior Living at Patrick Square is a faith-based senior living community comprised of 66 apartments which offer assisted living and memory care services. In addition, the community offers a continuum of care utilizing professionally trained nurses and caregivers available 24 hours a day. The community was designed to carefully consider each person’s physical, mental and spiritual needs and to engage those through daily recreational and social activities that provide purpose. The community features all-inclusive monthly rental rates without a length-of-stay commitment and includes laundry service, transportation services, and three chef-prepared meals a day, Wi-Fi, 24-7 surveillance monitoring, personalized care services, life enrichment programs, on-site medical assistance, therapy services and more. For more information about Dominion Senior Living at Patrick Square please visitwww.dominionseniorliving.com or call 864-722-2811.